Limited to 2,500 copies available worldwide. Region free. Includes all currently released DLC and a full-color manual. This release features reversible cover artwork. Box Text: A Reason to Believe in Rhythm Games Again! Speed through stunning, stylised environments tracing ribbons of light, releasing the energy in the music. Encounter strange enemies and fight epic boss battles all drive by an incredible licensed soundtrack. 09-12-2018 grahf16 Description Limited Run #143 Limited to 2,500 copies available worldwide. Region free. Includes all currently released DLC and a full-color manual. This release features reversible cover artwork. 05-16-2018 mookie802 Description Limited Run #143 Limited to 2,500 copies available worldwide. Region free. This is a list of VGCollect users who have Aaero in their Collection. This is a list of VGCollect users who have Aaero in their Sell List. 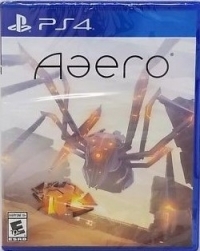 This is a list of VGCollect users who have Aaero in their Wish List.